Part of the reason why I was super excited to vacation to Europe was because I wanted to do research for my sequel...how old architecture looks in person and how the atmosphere of an old city feels. 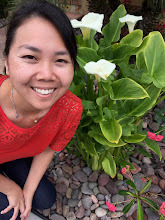 So, I wanted to start a series of posts about what I learned in Europe, concentrating on setting. Old-style travel is not as glamorous as I imagined. 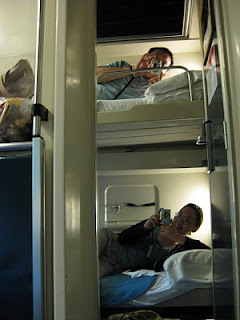 Admittedly, we were not on the famed Orient Express, but I thought traveling in an overnight train would be fun. Trips to the dining car and conversations in our train compartment and meeting new people as we walked the halls. No such thing. Our next door neighbors were talkative, but only because they had four other family members traveling with them and they were all back and forth between the compartments. Journeying down the halls only made me realize how uncomfortable the people in the 4-bed compartments were. No one was super talkative except for one guy, who asked us what was further down the train cars (answer: more compartments). And the dining car was really small and simple. No tuxedo-ed waiters. No flappers smoking. No dashing singles mixing. On top of which, it was super squishy! And we felt so gross after the night passed...no place to shower or freshen up. and a little of the icky feeling of motion sickness. What sparked my interest: I can't imagine being trapped in an overnight train for longer than the 13 hours we were on it. And then I started thinking about stagecoaches and old-fashioned cars. UGH! No wonder why people didn't travel very much back in the day. So uncomfortable! The challenge: Relaying the real-life, uncomfortable experience of travel in an old-fashioned setting.